Fashion, football and fishing are an unlikely combination. Admittedly if you took out the fashion component you’d have an otherwise ‘blokey’ long weekend. 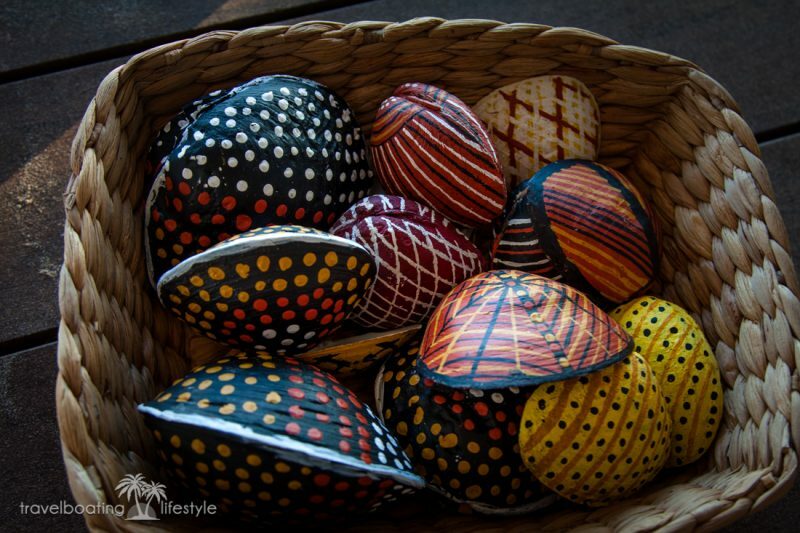 But, toss in some fashionable fabric, lovingly crafted with exquisite artistic creativity, and you’ll find yourself in the Northern Territory’s Tiwi Islands. Football is a big deal in the Tiwi Islands. Almost 35% of the population plays, fielding eight teams in the Northern Territory’s Tiwi Islands Football League. In these parts heroes wear footy boots and there are few stars more revered than Michael Long. He learnt his deft skills on red Tiwi Islands dirt before going on to become a dual Essendon premiership player. Long’s nephew Cyril Rioli played for Hawthorn, adding to the clan’s collection of Norm Smith Medals in the 2015 AFL Grand Final. So it’s quite an honour to be met by ‘football royalty’ Kathy Long, brother of Michael, mother of Cyril, when we arrive at Bathurst Islands dirt airstrip at Wurrimyanga. As Kathy shows us around, talk switches between football and art. ‘Cyril is number 33,’ Kathy states proudly for the benefit of those in our group who don’t follow AFL. 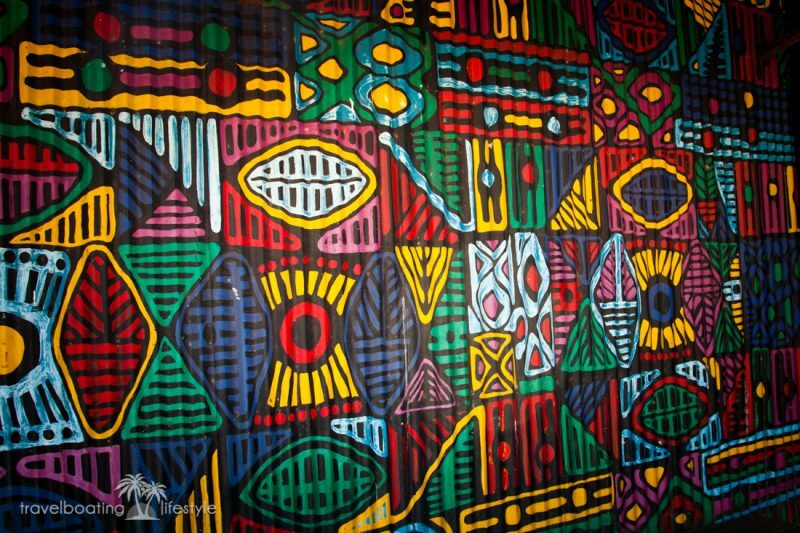 It’s the local famous art however that’s brought us to the Tiwis. It is everywhere. The airport’s concrete toilet block and terminal building are daubed in it. Passing burial grounds as we drive through town, Kathy points out carved and painted ironwood totems that encompass the spirit of those who have passed. 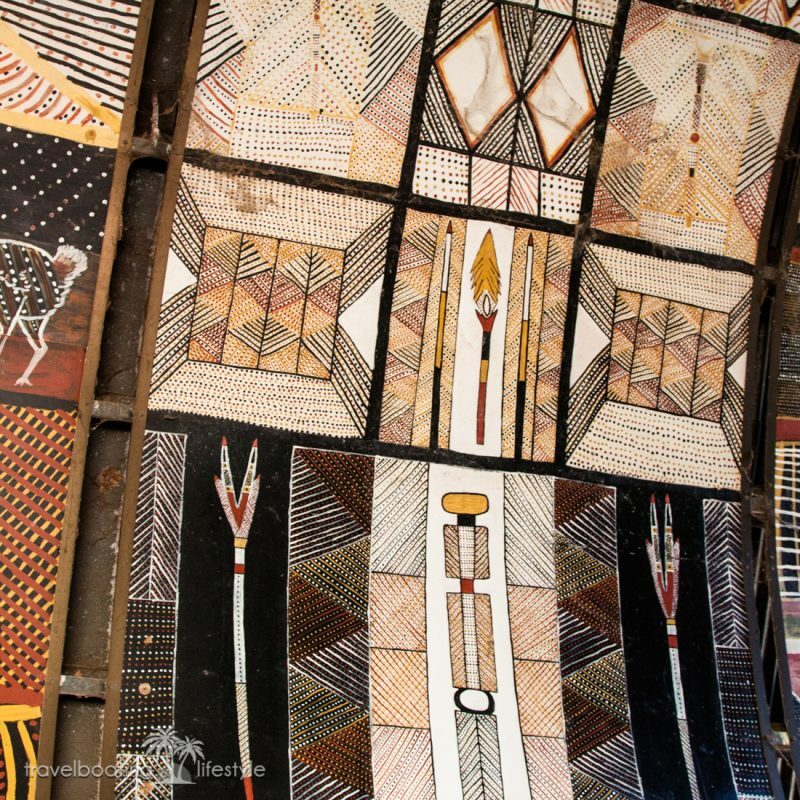 At Ngaruwanajiirri, the Keeping House, an arched ceiling is adorned with art in a sort of Tiwi Islands version of the Vatican’s Sistine Chapel. The paintings are exquisite. 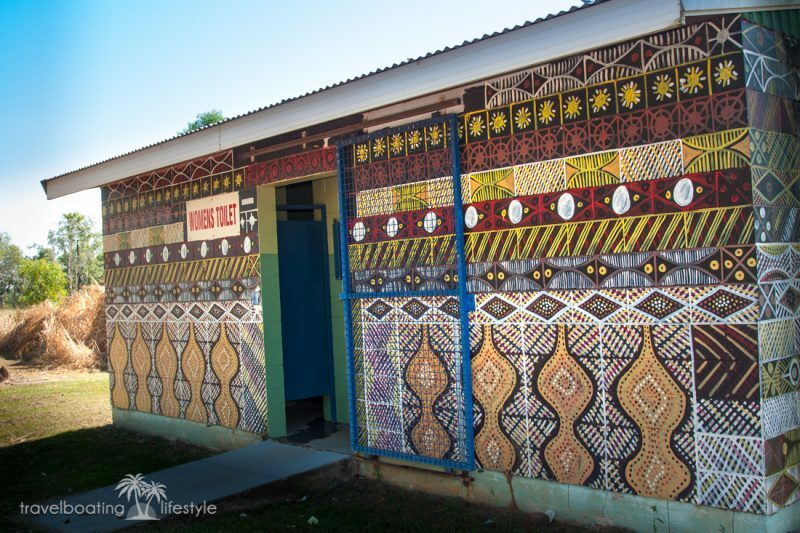 At the entrance to Tiwi Design Art Centre we’re greeted with a riot of colourful dots and lines enhancing rippled corrugation iron. 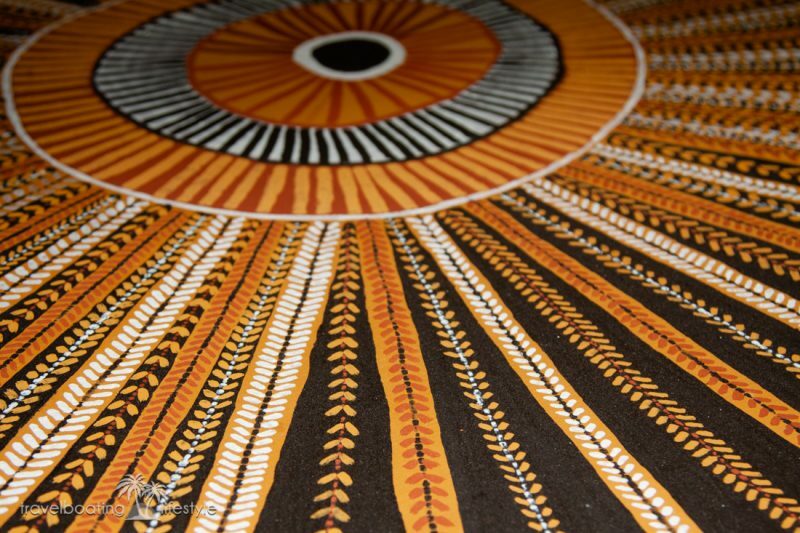 Inside, bolts of colourful fabric are piled high, their distinctive Tiwi designs prominent. Pinned out on a long table a strip of silk is being transformed with a Jock Puautijimi design which will retail for around $1,600. 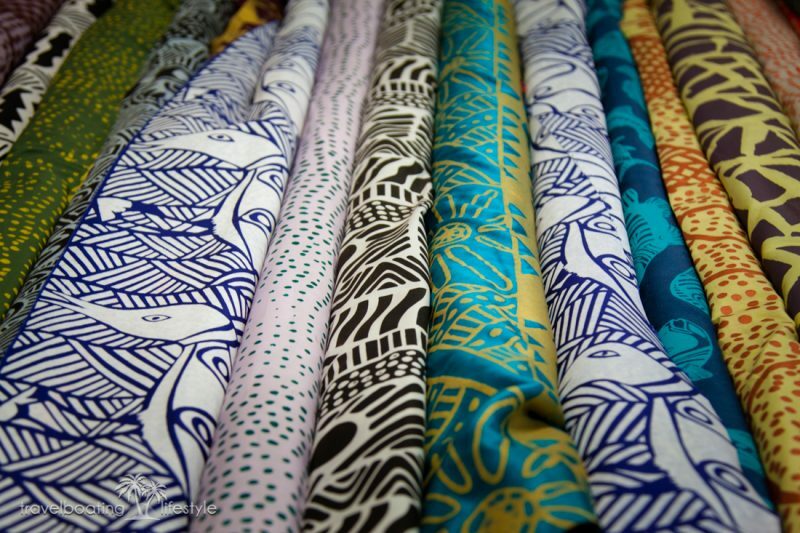 Whoopi Goldberg and Olivia Newton-John are both fans of Tiwi textiles. A faded newspaper clipping showing a Tiwi Design-clad Goldberg is proudly pinned to a board near the door. After a traditional smoking ceremony followed by lunch with the artists (damper is served with a smoky campfire aroma), screen printer Vivian leads a printing workshop, explaining how to achieve sharp lines as ink is squeezed through tautly framed silk. Departing with a custom printed length of fabric, I resolve to turn my unique souvenir into a skirt when I return home. 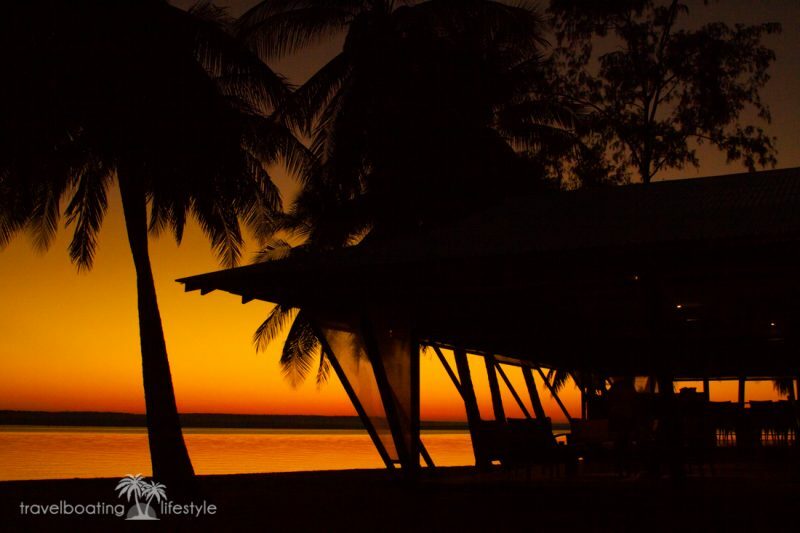 Formerly the haunt of sports fishermen whose needs barely went beyond a bed and cold beer, a $2m upgrade to Bathurst Island Lodge has raised comfort levels significantly. A new commercial kitchen dishes up menus tailored around the catch of the day. Plump sofas dotted across an expansive deck create a convivial hub for conversations, coffee or beers. There’s not a cloud in an implausibly blue sky. Coconut palms swish above sun-bleached sand. Despite its enticing location, host Karen advises us to avoid the beach and ‘stay on the deck as there’s plenty of crocs’. Later, we admire a fat-bellied 3 metre specimen from the safety of our tinnie while on a fishing expedition. Tell-tale slide marks are spotted during a Guided Beach Tour on a flat-bed trailer towed by host Lyndsay on his tractor. 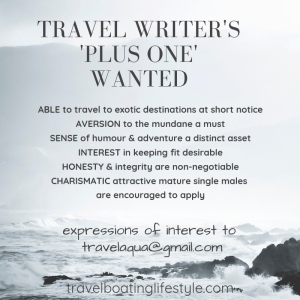 The trailer is utilised to enable guests to move between fishing boats and the lodge avoiding the need to wade ashore in croc-infested waters. Departing Bathurst by light plane bound for Milikapiti, pilot Brent gets us airborne from a cleared strip of dirt little wider than a suburban street. Below, a network of snaking mangrove-lined creeks clash with burnt-orange roads dissecting pine plantations. Jilamara Art Centre and Muluwurri Museum are our destination after lunch at Melville Island Lodge. We’re joined by some of the island’s artists on a veranda cooled by ocean breezes. Brian Farmer’s work has been lauded globally. He says his work is inspired by stories his parents shared around campfires as he was growing up. ‘Sometimes there is a story I follow to keep the memories alive,’ he says. ‘Like a journey of growing up, going through all the stages to manhood, like initiations.’ A soft-spoken handsome man with a luxuriant grey beard, Farmer’s 2014 Hobart exhibition was a sellout. Despite his gentle voice and humble nature, Farmer has the ability to command a room as he explains the striking canvases behind him. It’s a fascinating insight into stories revolving around family and ancient customs. 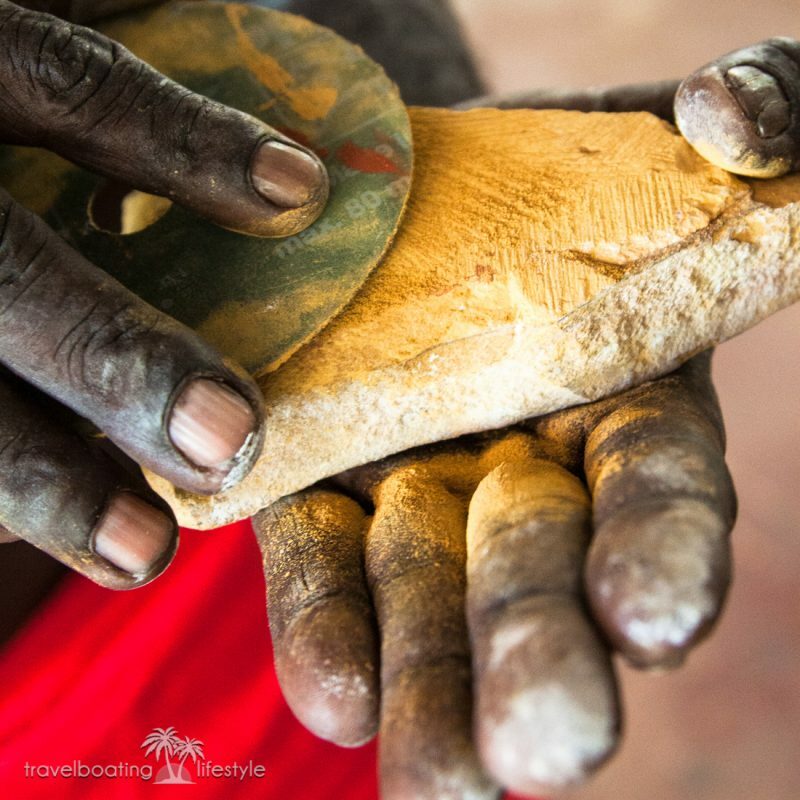 Whether artist, footballer or fisherman, Tiwi Islanders are in tune with the land, guided by traditions handed down through generations. 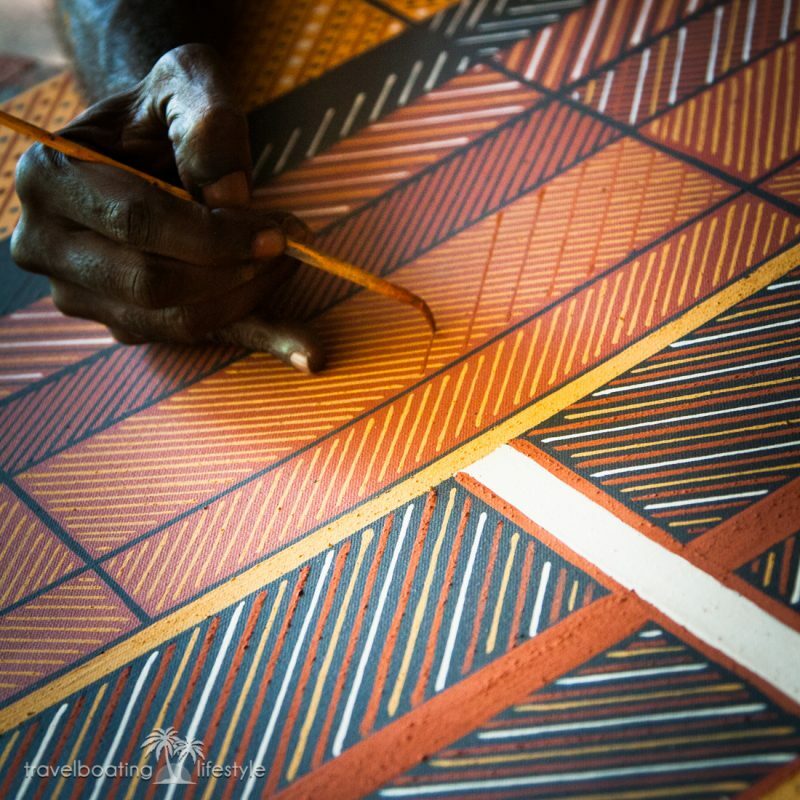 A short distance from downtown Darwin, Tiwi Islands culture is honest and authentic. And it’s thriving.